A prostrate, perennial, slightly woody plant, more or less hairy, especially on the new stems and leaves, extensively spreading on the ground and often forming patches of considerable size. Leaves oval or suborbicular, thick, coriaceous, evergreen, blunt or pointed at the apex, rounded or heart-shaped at the base, 1 to 4 inches long, one-half to 2 inches wide, smooth above when mature; petioles short and hairy. 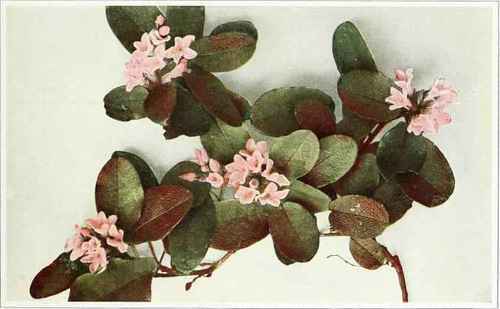 Flowers few or several in dense clusters at the ends of the branches, often more or less concealed by the leaves, very fragrant, pink or white, one-half to two-thirds of an inch long. Corolla with a tube expanding at the summit into a five-lobed margin or limb, nearly as broad as the length of the flower and very hairy within. Fruit a fleshy, hairy, slightly five-lobed, almost globular capsule about one-fourth to one-third of an inch in diameter, splitting at maturity along the partitions into five valves which spread backward into a five-parted rosette, exposing the fleshy interior. In woods, preferring sandy or rocky soil, often under or near evergreens, Newfoundland to Saskatchewan, south to Florida and Wisconsin. Flowering in April and May. Among our wild flowers, the Trailing Arbutus, often called Mayflower, is perhaps the greatest favorite and because of its prostrate habit and short stems, impossible to pick without uprooting some of the plant. It is also very sensitive to fire and sudden changes in the character of its surroundings, such as lumbering and grazing, so that in many localities where it was once common it is now rare or entirely exterminated.